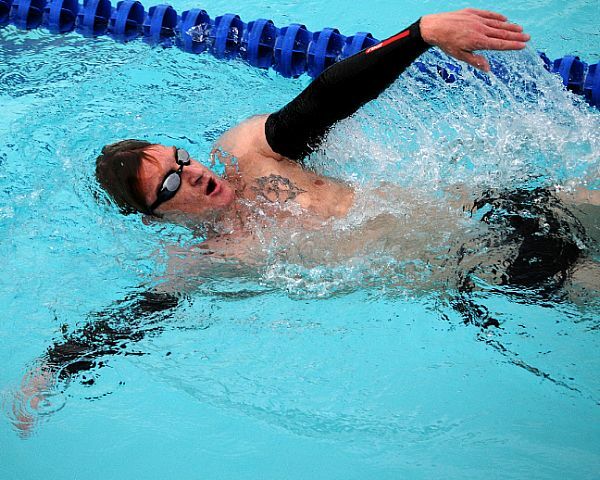 Lt. Brad Snyder has already proven his dominance in the water, earning three medals at the 2012 Paralympics in London. Now he’s looking to show that being blind won’t hold him back on land or a surfboard either. On May 19, Snyder is participating in the Trident Challenge — a 5K run, 500-meter ocean swim, and 1.5K ocean surfboard paddle — as part of the Never Quit weekend in Jacksonville Beach, Fla. He will be guided in the run and the paddle by Bethany Hamilton, a surfer who lost one arm in a shark attack. Snyder, a former explosive ordnance disposal technician, was on patrol in Afghanistan in 2011 when an improvised explosive device blast left him blind. The former Naval Academy swimmer got back in the pool soon after to regain some sense of independence. He is now an advocate for the COMMIT Foundation, which assists veterans transition to civilian life, and announced that he is training to earn a spot on the triathlon team for the Rio Paralympics in 2016. The Never Quit weekend also includes a 5k run, sunrise yoga on the beach and a Warrior Challenge, where military members will watch participants do push-ups, sit-ups, pull-ups, a 1.5 mile run and a low crawl across the beach to see if they could succeed as a member of the Special Operations community. The event’s goal is to raise awareness on how to prevent strokes and encourage families to lead a healthier lifestyle.